The Professional Dog Training Instructor course has been designed specifically for those who wish to become a professional dog trainer. We understand that there are many courses available, some better than others. Many courses claim to prepare you for a career as a dog trainer in a matter of weeks. We know this is not possible, and often leaves students frustrated and disappointed. We have instead designed a two tier journey that covers all that you need to know when working as a dog trainer. This programme is an intense three month programme that will train learners on training dogs! The focus is to introduce the theory behind training dogs while also intensely focusing on developing the learners dog training skills. A solid ability to train dogs is essential prior to developing the ability to train people to train dogs! 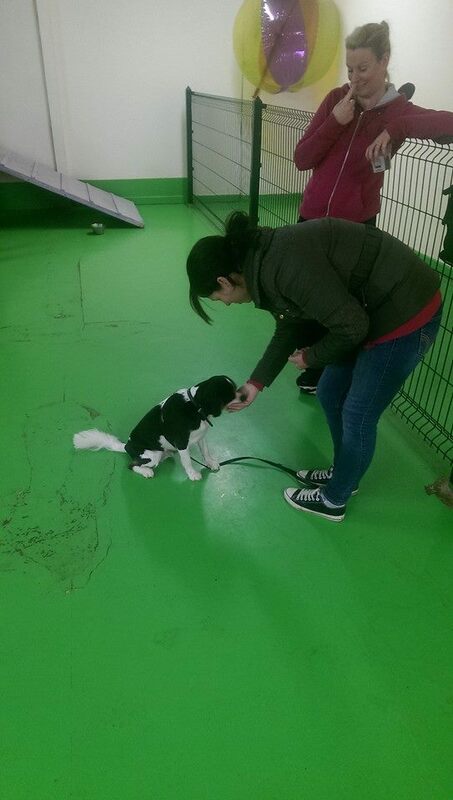 Our goal on this course is to continue to increase the number of responsible, educated, science based pain-free dog trainers available across Ireland. The course will focus on further developing the learners knowledge on all things dog training, while also developing their ability – and confidence – to train people on training their dogs. We will continue to support our students once they launch their own careers and our vibrant community of professionals will continue to empower and support one another. This course is delivered through online video lectures, classroom practical handling, and work experience hours, which allows for the course to be taken while also living away from the College / working full time. This module has been designed to give learners a professional understanding of the different development stages of dogs. This is fundamentally important as you are likely to take on clients with dogs of all ages. Understanding the different requirements that dogs of different ages have means that you will be able to successfully help clients and their dogs navigate through the journey of life with their dogs. Dogs are more complex, but also more straight forward than you would imagine! This heavy module will cover, in detail, how dogs brains change as they learn, how their nervous system can alter their learning ability, how hormones play a part in how dogs think and learn, and will also look learning theory in more detail. Upon completion of this course learners will have the ability to understand and explain the complexities of the different factors that impact the dogs abiluty to learn. Many people believe that the ability to communicate with dogs requires magical dust and the title Dr. Doolittle. However, the ability to communicate with dogs is a lot simpler. This module covers dog communication – from basic body language, to interpreting dog to dog play, the signs that aggression may be imminent, and how humans can alter their behaviour to communicate effectively with dogs. This module will help prepare learners for a career as a dog trainer. From understanding what is involved in the career, to what is not involved, from setting up a dog training business, to gaining employment in the industry. This module will also look at designing policies and procedures for your dog training sessions as well as personal safety and best practice while carrying out dog training duties. This module will cover the theory and hands on skills that learners need to successfully set up and host dog training classes. This module will cover the theory and hands on skills that learners need to successfully set up and host puppy parties and puppy socialisation classes. This module will cover the theory and hands on skills that learners need to successfully set up and host one to one training sessions. As a dog trainer you will be expected to develop content for your clients. This module will explore report writing for one to one training sessions, posters designed while advertising, step by step handouts for your clients, creating video content for social media and more. Learners will be expected to attend a minimum of 10 hours of work experience to develop their understanding of how different trainers train. This module will focus on the learners ability to reflect, critique, and grow from their own observations. The Professional Dog Training Instructor course has been designed specifically for those who wish to become a professional dog trainer. We understand that there are many courses available, some better than others. Many courses claim to prepare you for a career as a dog trainer in a matter of weeks. We know this is not possible, and often leaves students frustrated and disappointed. We have instead designed an eight month course that covers all that you need to know when working as a dog trainer. Your tutor on this course will be Nanci Creedon M.Sc. CDBC. Nanci has a degree in Zoology and a masters degree in Animal Behaviour. She is a certified dog behaviour consultant and also a certified pet dog trainer.